NetworkManager doesn't like IU's wireless network – it connects with much effort, then it grows confused by the abundance of access points; it can't settle on one access point so it tries to roam to the next one, resulting in randomly dropped connections all the time. This problem is much worse in the main library where density of access points seem to be better. I'm not sure why I haven't faced this problem in other places with abundant-wireless, so I can't lay all the blame on NetworkManager. Reportedly people with Mac laptops also face the same problem. Windows users somehow seem to be less affected. Some people have reported better success rates with wicd, but I haven't managed to make it work. Figure 1: Look ma, no wireless! I try not to pay much attention to the phone. It's a source of distraction as a device, and an annoyance as a phone like phones usually are. 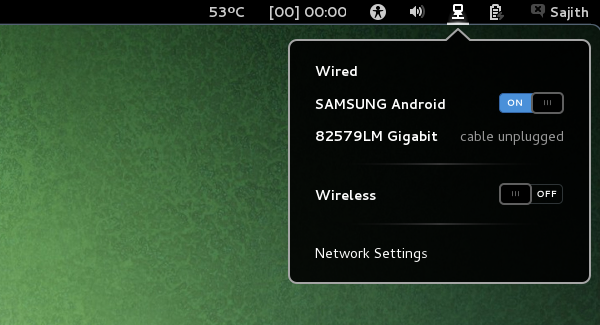 It hadn't occurred to me until yesterday that I can use USB tethering as a means to secure a stable connection with the intertubes. It even worked in the main library for several hours last night, with no problems at all. As a bonus, the phone also gets charged via USB while it's being of service. Squeee!